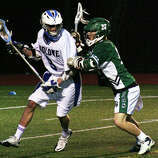 When the Darien boys lacrosse team is playing at its best, there is nary a team in the country who can beat them. The Fairfield Ludlowe boys lacrosse team learned this the hard way. Darien dominating the first half en route to a 17-4 win over Ludlowe at Taft Field in Fairfield. "We've struggled a little bit, offensively," Darien coach Jeff Brameier said. "But we just took it to them." Eight different Darien players scored goals as the Blue Wave improved to 9-2, and 5-0 against in-state teams. "That's what the best in the country looks like," Ludlowe coach Chris Parisi said. "They're in a class by themselves." Ludlowe lost for the third straight game. Nate Ryan scored twice and Brendan Errett recorded a pair of assists for the Falcons all coming in the second half. "The fact that our kids didn't quit, that's all we can ask from them," Parisi said. However, Brameier admitted he was intrigued by the Falcons. Ludlowe is now 6-4, with four losses to the Blue Wave, New Canaan, Staples and Brien McMahon. "I didn't know what to expect from them," Brameier said. Darien took control, seemingly, from the outset, scoring seven times in the first quarter and nine times in the second to take a 16-0 advantage at halftime. Senior Ben Preston scored four times, junior Tim Murphy and Richard Gregory recorded three goals and Jon Magnusson and Case Matheis each notched two goals as well. "We haven't clicked on offense like that so it was good," Brameier said. "We have a lot of special kids on both sides of the ball." "We've never had anybody put up 16 in a half against us ever," Parisi said. "It came from all over." Junior Clay Barker earned the praise of Brameier, for his faceoff prowess, in the first half. He dominated Ryan, his Ludlowe counterpart for the entire first frame, as the Blue Wave possessed the ball for the majority of the half. "(Barker) did a great job," Brameier said. "That surprised me, I saw Ryan do a good job against New Canaan." Kevin Seiler, Graham Maybell and Jamie Kerr each potted single tallies as well for Darien and Darien goalie Dylan Torey made seven saves. "It was a good instructional video they put up on us today," Parisi said. "That's how you play the game at the highest level." The Falcons' road will not get any easier, as Ludlowe will take on Ridgefield on Saturday at 3 p.m.